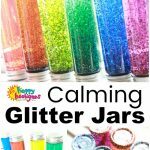 A glitter jar is easy to make and a wonderful tool for helping kids calm down when big emotions get the best of them. Pour clear glue to fill about 1/4 of your jar or bottle. Fill the jar with hot water to about the 3/4 mark. Add as much and as many colours of glitter as you'd like. add 1-2 drops of food colouring to the bottle. Stir well with stir stick. Top up jar with more hot water.